Studio Line: Artisan - This stash could set them up for life. James Van Der Beek and his friends come to the rescue in this spirited coming-of-age adventure set in Oxford, a struggling little town, smack dab in the middle of nowhere. Nothing ever seems to happen, that is, until farmers begin growing marijuana to pay their mounting debts. All seems to be going well until the DEA arrives. Suddenly everyone is running for cover and the pressure is on to hide the illegal crop. The tensions rise as the DEA infiltrates Oxford and turns a volatile situation into a more explosive web of intrigue. DVD: Fullscreen 1.33:1; audio English Dolby Digital 5.1, English Dolby Surround 2.0; subtitles English, Spanish; closed-captioned; single sided - double layered; rated R; 20 chapters; 99 min. ; $24.98; 6/19/01. Supplements: Audio Commentary With Director Stuart Burkin and Actor John Slattery; Deleted Scenes; Cast and Filmmaker Biographies; Theatrical Trailer; Photo Gallery; Production Notes. Since I became Mr. Big Shot DVD Reviewer, I’ve checked out innumerable films that I otherwise never would have seen. This means I’ve had quite a few enjoyable movie experiences that otherwise wouldn’t have occurred. Some were classics like My Man Godfrey and The Apartment, while others were more recent and minor pleasures like The Family Man and What Women Want, but the one constant remains: I would never have seen them were it not for this job. Add Cash Crop to the list of flicks I would not have taken in if I didn’t write reviews. However, that’s where the association ends. Crop definitely does not reside on my list of unexpected treats, as it offers one of the dullest and least compelling movie experiences I’ve seen recently. Crop - apparently called Harvest during its theatrical run in 1999 - takes place in the languishing farm belt, where the men who till the fields have seen better days. Large conglomerations make it exceedingly tough for small family operations to get by, and most of them struggle to survive. As such, some of these farmers try to get by any way they can, and to that end, they start to grow something more profitable: marijuana. However, the Drug Enforcement Agency (DEA) comes to town in the person of Becka Anslinger (Mary McCormack); she attempts to get to the bottom of this Deadheads’ paradise. The film mainly focuses on the Yates family. They’re doing better than other farms, allegedly due to the sale of flowers. However, as the story unwinds, we find out that father Jake (Jeffrey DeMunn) is the ringleader of the pot plot. Son Andy (Wil Horneff) becomes involved mainly because he worries about the family’s future when Agent Anslinger sniffs around their farm. Cash Crop touts itself as a “coming of age” drama, and Andy stands at the heart of those aspects of the film. However, he really doesn’t show much growth. He hangs out with some stoner friends and he starts to date Mina Fuentes (Paula Garces), whose brother is the local dealer. I suppose the fact that marijuana surrounds Andy but he never partakes of it is supposed to mean something, but what I don’t know. Actually, that last statement applies to Crop as a whole - what exactly is the point of this endeavor? The tale unfolds at a miserably slow pace, and the early expository and character development add up to little. The participants remain undeveloped and bland, and the plot displays little drama, tension, or anything else that might make us care about the movie. Events occur for artificial reasons to spice up the proceedings, such as a drug-related car accident that badly harms one of Andy’s friends. This plot point goes nowhere, but theoretically it gives us something tragic to watch. This tale could have been interesting; in fact, it should have been interesting. However, in the hands of director Stuart Burkin, Crop becomes an unmitigated bore. Nothing of interest happens, and any potential debates about marijuana or the plight of the family farmer are swept under the rug. Instead, because the film focuses on drippy Andy, we basically find little more than a sappy teen drama. Andy may be one of the least stimulating and compelling characters to ever grace a movie screen, and Horneff does little to give the part charisma or spark. Granted, why should he? No one else made the movie interesting. At times it almost felt as though those involved actively attempted to avoid worthwhile events and story points. It also seemed like they went out of their way to neglect subplots and characterization. I’ve seen a few movies that were duller than this, but I find it hard to think of them right now. One additional major source of irritation comes from the DVD case for Cash Crop. If you examine my previous comments, you’ll not find the name “James Van Der Beek”. While the actor appears in the film, he plays a very small role that has little to do with the story. 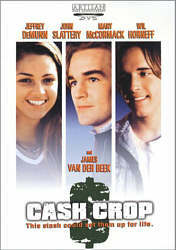 However, he’s pictured prominently on the cover, and the plot synopsis on the back states that “James Van Der Beek and his friends come to the rescue in this spirited coming-of-age adventure set in Oxford, a struggling little town, smack dab in the middle of nowhere.” That sentence contained additional misinformation, but the manner in which it promotes Van Der Beek as a major part of the film seems sleazy at best. Making matters worse is the fact that the synopsis shows Van Der Beek’s name with print twice as large as the rest of the words, and in a different color to highlight it. Van Der Beek’s mug even adorns the disc’s artwork, and a large image of his face crops up inside the DVD’s booklet. All of this clearly attempts to convince us that he’s a major presence in the movie, which is a total lie. I guess the powers-that-be felt Cash Crop needed all the help it could get, and if that meant they had to exploit Van Der Beek’s modest fame, so be it. Unfortunately, all this does is leave an even more bitter taste in my mouth. Under the best of circumstances, Crop would fall flat, as it was a dull and lifeless film with very few moments of interest. The cheesy manner in which the promotional artwork misinformed viewers made matters worse. Cash Crop should be avoided at all costs. Cash Crop appears in an aspect ratio of 1.33:1 on this single-sided, dual-layered DVD; due to those dimensions, the image has not been enhanced for 16X9 televisions. In regard to the movie’s original aspect ratio, the DVD’s case muddies the waters. On one hand, it claims that Crop was “formatted from its original version to fit your screen”. On the other hand, the package also states that the flick is “presented in the original 1.33:1 format in which the film was shot.” This may denote that Crop offers an open matte transfer and not a formal pan and scan affair, but the situation doesn’t become clear. Nor does the picture itself, as Crop provided a surprisingly weak impression for such a recent film, as it suffered from a mix of concerns. Sharpness looked rather erratic. For the most part, the movie appeared reasonably accurate, but quite a few shots displayed an awfully soft and fuzzy look. Other problems popped up, as I found occasional examples of moiré effects and jagged edges, and some edge enhancement also appeared. Print flaws included light grain and some speckles, but these issues remained reasonably minor. While I didn’t expect a movie about the Farm Belt to feature a vivid palette, the setting didn’t explain the drabness of the hues seen in Crop. Throughout the film, the colors looked bland and lifeless, as they showed rather muddy and flat qualities. Skin tones displayed a vaguely pinkish tint as well. Black levels also came across as murky and without depth, and shadow detail appeared a bit heavy and thick; low-light situations were too dense and opaque. Cash Crop nearly earned a “D+” grade for picture. I went with the slightly higher “C-“ mainly because the film lacked significant print flaws, but make no mistake: this was a weak image for a new movie. The Dolby Digital 5.1 soundtrack of Crop was a more satisfying affair, though it provided no special pleasures. Actually, though the quality seemed to be generally solid, the mix suffered from one major concern that caused me to drop my grade one full letter. Based on its other merits, I planned to give Crop a “B”, but unfortunately it seemed apparent that at least some - if not all - of the right/left audio was reversed. Since the movie didn’t feature a tremendous amount of discrete sound, this wasn’t always easy to recognize, but during a few scenes, it became clear that the channels were backwards. To see for yourself, check out chapters 15 and 19, where the reversals appear more obvious. I will admit that because the soundfield remained fairly subdued through the movie, this defect wasn’t a major problem. The track stayed pretty firmly within the forward channels, where it provided some modest elements. Music dominated the proceedings, as the score featured fairly solid stereo separation and emanated nicely from the forward spectrum. For the most part, effects rarely rose above the level of general ambience, and that factor spread to the surrounds as well. During a scene that involved a helicopter, the rears featured some decent activity, but as a whole the remained minor partners in a subdued package. However, audio quality seemed reasonably solid. Dialogue appeared somewhat stiff at times, but speech generally came across as fairly natural and warm, and I discerned no problems related to intelligibility or edginess. Effects were accurate and distinct, and they showed no signs of distortion or other flaws. The soundtrack’s main redeeming factor came from the music. Paul Rabjohns’ score consistently appeared nicely bright and dynamic, and it showed off the best aspects of the mix. As a whole, the audio for Cash Crop seemed to be accurate and reasonably vivid but unspectacular, though one major defect negatively affected my rating. Despite the extremely low profile of this film, Cash Crop offers a decent roster of supplements. First we find an audio commentary from co-writer/director Stuart Burkin and actor John Slattery. Both were recorded together for this running, screen-specific affair. Despite my dislike of the movie, I thought this was a reasonably interesting piece. Actually, the commentary started strong but became more erratic as it continued. During the earlier stages, Burkin offered a lot of good information about the project’s origins, and both men related compelling details about the facts of life as they regard low budget filmmaking. However, after a while, the track began to peter out a bit. Burkin and Slattery continued to provide decent data on an intermittent basis, but more gaps were apparent, and things slowed somewhat. Nonetheless, I still thought this was a generally useful and entertaining commentary. Next we discover a collection of four Deleted Scenes. Each runs between 75 seconds and 107 seconds for a total of seven minutes worth of footage. Since I found the movie to seem so dull, it appeared unlikely any unused material would interest me, and this was the case. The excised segments generally offered moments that fleshed out the characters to a degree, but I didn’t think that any of them would have added anything to the movie. Interestingly, three of the four clips are letterboxed, unlike the fullscreen film itself. All of the deleted scenes can be viewed with or without commentary from Burkin; Slattery didn’t seem to be present for this session. For the most part, Burkin violates the first rule of deleted scenes commentary: tell us why the segments failed to make the film. During the final two clips, he vaguely remarks that those snippets were “probably” removed for time reasons; frankly, he appears rather unsure of his own movie. However, he does provide some useful subtext for the different pieces, and he tells us how they would have fit into the completed package. Though his statements fail to strongly relate the most important information about the scenes, he still gives us some good data. A Picture Gallery includes 12 photos, most of which are candid shots from the set. Two sections add information about the people who made Crop. Cast Biographies features listings for actors Mary McCormack, John Slattery, Jeffrey DeMunn, Wil Horneff, James Van Der Beek, Evan Handler, Fred Weller, and Peter Raymond, while “Filmmakers’ Biographies” adds entries for co-writer/director Burkin, co-writers James Biederman and David M. Korn, and producers Lemore Syvan and Ron Kastner. As a whole, these offer some decent details about the various participants’ careers, and they’re above-average representations of this format. Lastly, we get a brief text Director’s Statement within the DVD’s booklet and also the film’s theatrical trailer. The latter continues the parade of Crop deception. It shows lots of Van Der Beek, and it misrepresents the story line. Perversely, it also reveals many plot points and essentially gives away the ending. I guess I shouldn’t be surprised to find such an unrepresentative ad tossed in with this misleading package. As a movie, Cash Crop is a dud. It offers a boring and monotonous look at a potentially interesting subject, and it provides very little of interest. The DVD features bland and flawed picture and sound plus a surprisingly decent roster of extras. All of this is wrapped in garb that badly deceives consumers into believing that they’ll get something completely different than what they’ll find. Avoid Cash Crop like a plague.